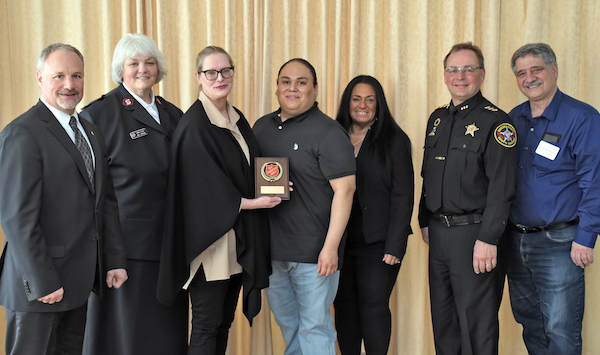 “By May 2019, the Centrisys/CNP employees will have contributed over $15,000 to the Salvation Army and the company matches match all of our employees’ contributions dollar-for-dollar,” said Jim Andresen, the company’s COO. Grundfos won the award for Company of the Year in the global water and wastewater pumps market at the annual awards show of consultancy company Frost & Sullivan held in London last week. In the award report, Frost & Sullivan cited superior offerings of sustainable solutions for a better world and commitment towards a customer-centric service, coupled with market foresight and innovation- driven growth. Kamstrup has posted record-breaking revenue for the ninth year in a row with turnover of $367 million in 2018. The pre-tax profit for 2018 was $49 million. The result further solidifies Kamstrup's position as one of the front-runners in the digitization of water and energy distribution networks around the world, according to Kamstrup CEO Kim Lehmann. MARS Company have announced that due to overwhelming positive demand it has extended the C715 Test Bench Equipment Upgrade Program. This upgrade program allows MARS' customers to protect their equipment investment and provides special incentives enabling customers to upgrade their existing MARS test bench equipment to comply with the new ANSI/AWWA C715-18 industry standard. Cynash Inc. has announced the opening of a new office in Belfast, Northern Ireland, and the formation of an international subsidiary. Cynash International Ltd. is a wholly-owned subsidiary of Cynash Inc. Instrumental to this expansion was Invest Northern Ireland, a business development agency that attracts new investment to Northern Ireland while helping businesses compete internationally. The office opened on March 14. U.S. Water Services Joins Kurita Water Industries Ltd.
U.S. Water Services, Inc. has announced that is has joined the Kurita Water Industries Ltd. companies, a leading international water management company headquartered in Tokyo, Japan. The acquisition was announced in early February 2019 and was completed effective March 26, 2019. XPV Water Partners, has announced that it has invested in Holland Pump Company. The Company is a leading independent specialty pump rental and dewatering solutions provider in the United States. Brown and Caldwell has announced its selection by the Lower South Platte Water Conservancy District and other stakeholders to lead the South Platte Regional Water Development Study. Why is tap water better than bottled? That’s what engineering students will answer as part of their application to WSSC’s annual Commissioners’ Engineering Scholarship Program, worth up to $10,000 in scholarship money and paid internship experience over four years. The scholarship program, which officially opened today, supports the Commission’s ongoing efforts to attract aspiring engineers to careers in the water industry. As the largest water utility in Maryland, and one of the largest in the country, WSSC is proud to produce and deliver safe, clean and reliable tap water to our 1.8 million customers daily. We are passionate about our water and even prouder of our superior track record in delivering this excellent product to our bi-county residents for the past 100 years. In 1,500 words or less, tell us why tap water is better than bottled water. Please be sure to address all relevant factors and scenarios in making your case. Saudi Arabia’s Saline Water Conversion Corporation (SWCC) and Hyrec Technologies Ltd. signed a Memorandum of Understanding to deploy Hyrec’s Osmotically Assisted Reverse Osmosis (OARO) technology for Zero Liquid Discharge desalination in the Kingdom of Saudi Arabia. The Memorandum of Understanding was signed at the 2019 Saudi Water Forum in Riyadh by Eng. Ali bin Abdulrahman al Hazmi, the Governor of SWCC, and Hyrec’s CEO Dr. Basel Abu Shark. Jerry Schlicker promoted from Controls Engineer to Engineering Manager at Duperon Corporation. Nuvoda hires new CEO, Zain Mahmood.